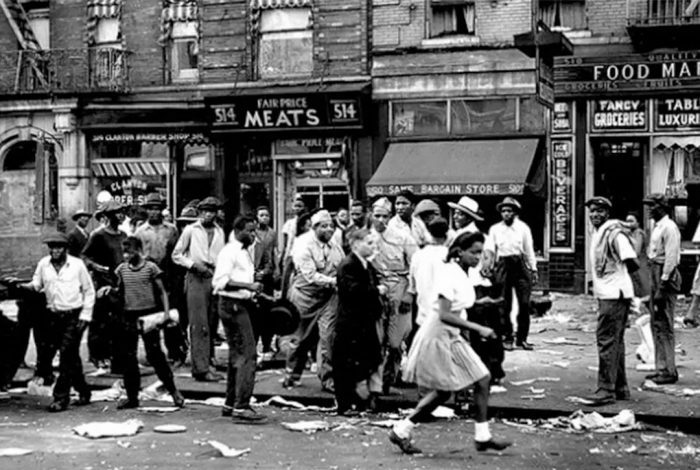 1943 Harlem Race Riot: What the Hell Happened? Seventy-five years ago in Harlem, an argument started over a dollar bill. It ended up in a riot costing the lives of six people (five shot by police), 495 injured, over 500 arrested, and an estimated five million dollars ($75 million in 2018 dollars) in damages to property — white-owned property. On August 2, the riot was over thanks to the work of 6,600 city, military, and civil police officers; 8,000 state guardsmen; and 1,500 civilian volunteers. The details over how it started vary, but maybe they don’t matter so much. When you look at the big picture (see further below), you know that almost anything might have ignited that riot. Protect me from this white man! Bandy started to grapple with Collins, to loosen his grip on Polite. His mother joined him. In the scuffle, Bandy grabbed the policeman’s nightstick and struck Collins on the head, knocking him to the ground. Bandy started to bolt, but Collins … pull[ed] his service revolver from its holster and fired at the retreating soldier. Bandy contended [sic] that he protested when Collins pushed Miss Polite, and the police officer reacted by throwing his nightstick, which Bandy caught; when the soldier hesitated to return the weapon, Collins shot him. Bandy, shot in the shoulder, was able to walk to a nearby hospital where he recovered. But someone in the crowd of about 3,000 people gathered at police headquarters said Bandy had been killed. The rumor grew to include the detail that he had died defending his mother. In less than an hour, the first window was broken, and the mayhem began. The riot led to reforms. Among other things, Mayor Fiorello Laguardia ordered the establishment of the Federal Office of Price Administration in Harlem to investigate complaints of alleged price gouging. Landlords had been violating voluntary price restraints when lease renewals were due. Fiorello put the pressure on city agencies to force landlords to comply with cost controls. And he ordered the re-opening of the Savoy Ballroom. But Jim Crow was never very far away. Such an outlook is puzzling, but here’s a possible clue: From the time he was 18 years old, Johnson — a black man from South Carolina — spent much of his life among white people in the US and in Europe, and he married a Danish textile artist. Would it be simple-minded to wonder if he had absorbed a white attitude toward blacks, and if he stayed mostly outside the big picture described below? The riot occurred during the war when things were tough all over for people of all races, but worse for those in black communities. They had been subjected to police brutality, discrimination in jobs and housing, and price gouging by merchants and landlords. One of the ugliest and saddest aspects of this period concerned black veterans returning from the war. They had hoped that their service would finally earn them some respect. In fact, the opposite was true. White racists feared that, with their newly acquired skills in fighting and government-issued weaponry, blacks who did not “know their place” were less likely to stay in it. In several southern US states, they were murdered on the slightest pretext. 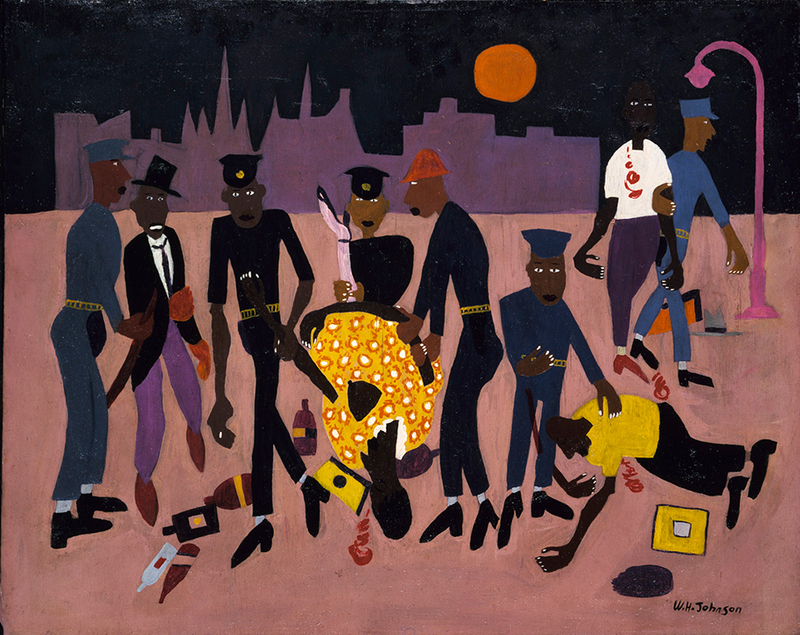 When Bandy hit Collins over the head with that club, he was not mad with him only for arresting a colored woman, but he was mad with every White policeman throughout the United States who had constantly beaten, wounded, and often killed colored men and women without provocation. The riot in Harlem was one of five that year. The others took place in Detroit, MI; Beaumont, TX; Mobile, AL; and Los Angeles, CA. BOTH HITLER — AND JIM CROW? Related front page panorama photo credit: Adapted by WhoWhatWhy from Harlem riot (Sam Kanter / YouTube).